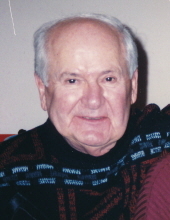 Molner, Carl N. formerly of Madison Heights, MI passed away on Thursday, January 24, 2019 at the age of 93. He was born on August 7, 1925 in Hazel Park, MI to the late Stephan and Rosie Molnar. Beloved husband of Mildred (nee Davis) for 63 years. Devoted father of Debra (Steve) Gregory and Patricia Molner. Adoring & adored grandfather of Julie (Tim) St.Onge, Jennifer (Gabe) Edgerly, Daniel (Jolie) Gregory, and Amy Molner. Dearest great grandfather of Adam St.Onge and Andrew St.Onge cherished brother of Helen Ristau, predeceased by brothers Steve, Joe, and John, and sisters Sally, Mary, and Ann. He will be dearly missed by many nieces, nephews, relatives, friends, and his recent caregivers. Carl served his country for 10 years during World War II and the years following. He worked for General Motors of Warren, MI for 30 Years as an engineering clerk. Carl was a caring and supportive man. He was known to all for his warmth and genuine sense of humor. His selflessness and fierce loyalty to his wife and family filled each and every one of his days. His only wish was to be with his family and see that they were provided for, never wanting anything for himself. His jokes and laughter will live on in the hearts of all that knew him. Carl was laid to rest at Roseland Park Cemetery on Friday, February 1, 2019 after a private family service held at Sawyer Fuller Funeral Home & Cremation Services. To send flowers or a remembrance gift to the family of Carl Nick Molner, please visit our Tribute Store. "Email Address" would like to share the life celebration of Carl Nick Molner. Click on the "link" to go to share a favorite memory or leave a condolence message for the family.